This is one of those Craigslist finds that I never acted on and regret! When I first met Sarah Lyon (@dctoat) about a year ago, I basically thought she was the little sister I never had. She loves Higher Education as much as I do, loves interior designs AND...she's an amazing Craigslist shopper. The stuff this woman has gotten off Craigslist blows my mind. Ya'll, she's like a NBA Baller status Craigslister. Recently we put our heads together to come up with a little bit of a rules of the Craigslist game...you know a list of "Helpful Tips to Navigate Craigslist". What do you think we should add to the list? Do you disagree or agree with the points we have made? I'd love to hear your feedback and stories!! Check out Sarah's blog for all sorts of fun tips and MAJOR design inspiration and don't forget to check out my DC Craigslist Roundup every Friday right here on le blog!!!! -Post clear pictures and a detailed description. Sometimes I have forgotten to take and post measurements and then get tons of questions from interested buyers. It's easier to anticipate questions like these ahead of time and include this information in the original posting. Be clear about what it is you're selling--sure, your coffee table is clear or see-through, but is it technically also acrylic or lucite? Does the vintage dresser you're selling happen to be campaign-style? Do a little research before writing your post--who knows, maybe an item is worth a lot more than you thought, and adding specific words can also help you show up in more searches. -It's better to be honest about an item's flaws than to hide them. It's a waste of time for you (not to mention, for the buyer) to schedule a pickup only for the buyer to change their mind because they weren't aware of a scratch or mark that diminishes the quality of the item. (Obviously, all used furniture has some amount of wear and tear, but if you look at your item and see immediately see anything that stands out as less than perfect, disclose it!). I've had instances where I've gone out of my way to grab something only to realize that it's much shabbier than it looked online. I usually have still taken it home with me (I have a hard time saying "no!" in general! ), but it can be frustrating. 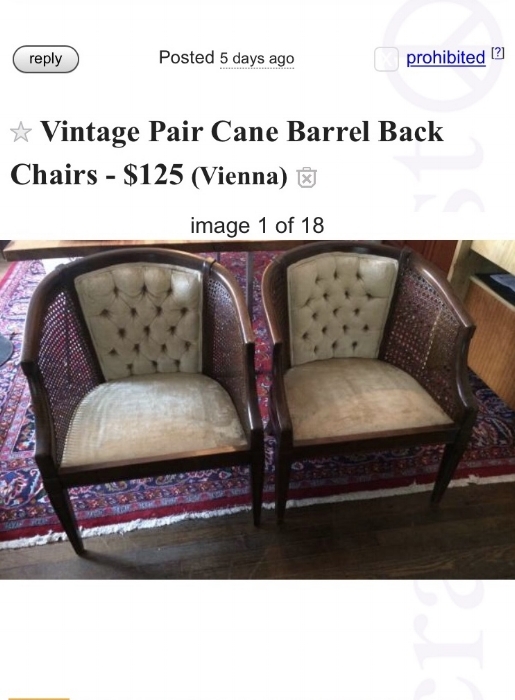 I bought these chairs for a client and wish there had been more details about the condition of the chairs on the post. They weren't bad - I just wish I had known what to expect. -Price items fairly. Even if something is like-new (maybe you took it out of the box and realized it just doesn't work in your home), still think about offering a discount. Otherwise, why would a buyer have incentive to purchase it from you rather than directly from the retailer? Prices don't necessarily need to be garage sale low, but they shouldn't scream boutique furniture store, either. Pricing items to sell is the key to getting them out of your house, fast! -Remove sentimentality from the equation. I’m sure your great grandmother was the sweetest woman on earth and obviously she had great taste because I’m interested in her table! But, don’t price with your heart – price with your head. If an item is really that special to you, perhaps you should consider holding on to it for a few more years until you are ready to part with it. -Look up style terms for things you may be interested in purchasing. If you are a fan of mid-century modern furniture, then terms such as “MCM” and “mid-century” may give you desired results. If you know even more specifically what you want, then look up terms like “Parsons” or even a designer like “Baughman,” or “Baughman-style,” if you are okay with the item being a reproduction. I found this using the search term "chinoiserie". - If you are dead-set on getting a particular type of item, create an account and save your searches. This way you can be alerted via email when new items are added to the site. Be careful, however, if you add terms like “mid century” and save an alert. You may be getting a huge amount of emails as things are listed with that term throughout the day. -Scroll, scroll, scroll. You can craft the best search in the world only to stumble upon a mid-century gem that was simply described as “dresser.” If you’re feeling patient, just click through current listings page by page, and you might be surprised at what stands out. (Maybe you’ll find something you didn’t even know you needed!). -Look for potential in an item. Even if a piece isn't perfect now, that doesn't mean it won't look adorable with a coat of fresh paint and some new hardware. While it is difficult to find a classic piece in pristine condition, a little DIY will go a long way. If something has seen better days but still has good "bones," use your imagination and think about what it would look like in a new shade or with some modern updates. -Email/text a seller right away after seeing the posting, as sometimes items can get snagged in a matter of minutes! If you need further information, like clarification on color or measurements, ask away. If you know that you would 100 percent like to purchase an item, say so, and note that you can come by at such and such time (the sooner, the better) and ask if that would work with the seller's schedule. -Use correct grammar and spelling in your email. I have definitely ignored messages that are less than coherent because they don't give off the best vibe...you're a stranger to the seller, after all, so you want to put your best foot forward! Be clear, polite, and succinct, and you're more than likely to get a prompt response. - Negotiate price ahead of time. If you are exchanging messages with the seller, make sure to be clear about the price you are seeking. Be reasonable when expecting a bargain. Shaving off a few bucks is appropriate but asking for half would likely insult the buyer and may end the deal. -If the seller requests cash only, bring exact change. Don't expect people to have small bills on them (and worst of all, don't show up $5 or $10 short and then ask the seller on the spot if they would be willing to take less, unless you spot a major flaw in person). I often ask people in advance if they're ok using Venmo, especially for larger purchases, but some people may say no. Plan ahead and stop by an ATM en route to picking up your purchase, and I guarantee the seller will thank you! -Don't be late showing up to pick up the item, and if you need to reschedule or are stuck in traffic, contact the seller sooner rather than later. Exchange phone numbers if you haven’t already, assuming the seller is willing. Respecting other people's time is always KEY. (Same goes if you're a seller--if you tell a buyer you'll be at home or plan to meet them by a shopping center at a particular time, be there!). I once had to wait at the metro station (our designated meeting spot) for over 30 minutes. I debated leaving but reallllly wanted the chair that the person was selling. However, the experience was annoying and left me a little creeped out, especially because the person wasn't being responsive to my calls or texts for the firsts 20 minutes or so before finally stating that she was on the way. I would love to know what tips we missed? What are some of your tried and true strategies?